The Mix V.I.P. Club (the "Service"), operated by Triton Loyalty, and KMXI-FM (together, Triton Loyalty and KMXI-FM are referred to as "we", "us" or "our") is provided to you ("you," "your" or "User") under the following terms and conditions, including any amendments thereto and any additional terms and conditions, rules or policies that may be applicable to particular offerings made in connection with the Service (collectively, the "Terms and Conditions"). We reserve the right to update or change these Terms and Conditions from time to time. Any such changes shall be reflected in an updated version of the Terms and Conditions posted on this site. By continuing to use the Service following the posting of any such change, you will be deemed to have agreed to the amended version of the Terms and Conditions. Any failure to comply with these Terms and Conditions by you may result in the termination of your account, and the forfeiture and relinquishment of all Points you have accrued in the Service. BY REGISTERING TO USE THE SERVICE, YOU AGREE TO BE BOUND BY THESE TERMS AND CONDITIONS, SO PLEASE READ THEM CAREFULLY. Unless otherwise specified in connection with particular offerings, participation in the Service is open only to natural persons who are 13 years of age or older. Employees or agents of KMXI-FM, Triton Loyalty, and each of their respective affiliates, and immediate family members of or persons domiciled with any such persons are not eligible to participate. In consideration of your use of the Service, you agree to provide true, accurate, current and complete information about yourself as prompted by the registration form and to maintain and promptly update your personal data to keep it true, accurate, current and complete. If you provide any information that is untrue, inaccurate, not current or incomplete, or if we or any of our service providers have reasonable grounds to suspect that such information is untrue, inaccurate, not current or incomplete, we have the right to suspend or terminate your account and to refuse any and all current or future use of the Service (or any portion thereof) by you. You may not register with a disposable email address. Only one member account per person and two member accounts per household. If you are 13 years of age or under you cannot post information about yourself on the website or complete the registration process. You can, among other things, review your accumulated Points, review the Terms and Conditions as amended from time to time, and review redemption options at kmxi.listenernetwork.com . KMXI-FM and Triton Loyalty (collectively, 'us', 'we', 'Operators') have created this privacy statement in order to demonstrate our firm commitment to privacy. The following discloses our information gathering and dissemination practices for the Mix V.I.P. Club website ('Site'). This sweepstakes will begin on 1/15/2019 12:00 AM PT and all entries must be received by 2/11/2019 12:00 AM PT. You currently have 0 entries. SWEEPSTAKE PERIOD. This sweepstake (the "Sweepstake") is sponsored by Enticent, LLC d/b/a Triton Digital located at 2125 Barrett Park Drive., Suite 112B, Kennesaw, GA 30144 (the "Sponsor") and runs between 01/15/2019 at 12:00 AM PT ("Eastern Time") and 02/11/2019 at 12:00 AM PT (the "Sweepstake Period"). The clock used by Sponsor to compute the Entries (as such term is defined below) will be the official clock to determine the date and time of receipt of an Entry. For the purposes of this Sweepstake, the "Sweepstake Group" is composed of the Sponsor and Deer Creek Broadcasting (the "Publisher") together with their respective affiliate, related parent, sister and subsidiary companies, retailers, franchisees, and any other corporation, partnership, so proprietorship or other legal entity directly involved in the Sweepstakes and each of their respective officers, directors, employees, agents, dealers and other representatives. Online Entry: LIMIT: one (1) online entry per person per day during the Sweepstake Period.To obtain one (1) online entry into the Sweepstake you must (i) have a registered member account on the Publisher's website. If you do not already have one you can create one free of charge; and (ii) visit http://kmxi.listenernetwork.com/app2/Contest/3lcoyd (the "Sweepstake Website") during the Sweepstake Period and complete the entry form with your full name, email address, age and ZIP code and, if required, submit the required number of points, which number of points will then be deducted from your account. An entry will not be valid unless all of the required fields of the online entry form are completed and the information is valid. Mail-in Entry:You may also participate in the Sweepstake through a mail-in entry. 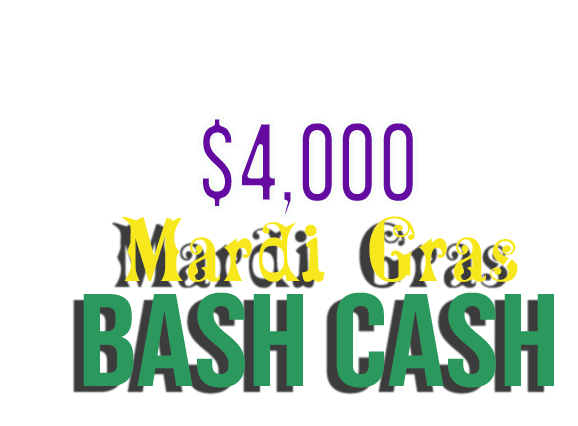 No Points are required for a mail-in entryLIMIT: one (1) mail-in entry per person during the Sweepstake Period.In order to participate in the Sweepstake by mail, you must mail a 3" x 5" card to Triton Digital, $4,000 Mardi Gras Bash Cash Sweepstakes, 2125 Barrett Park Drive., Suite 112B, Kennesaw, GA 30144, which must include the following information in legible, hand-printed or typed English: (i) your full legal name; (ii) complete mailing address; (iii) home telephone number with area code; (iv) email address; (v) your age; (vi) your gender; and (vii) the name and Item ID number of the Sweepstakes (3LCOYD) (each a "Mail-in Card", and collectively the "Mail-in Cards"). All Mail-in Cards must be received on or before the end of the Sweepstake Period, except that if the end of the Sweepstake period falls on a Saturday, Sunday or statutory holiday in the United States, your Mail-in Card must be received by the immediately preceding business day. If you are concerned about your Mail-in Card being received by the end of the Sweepstake Period, during the three (3) business days immediately preceding the end of the Sweepstake Period you may fax in a photocopy of your Mail-in Card to 770-919-2120. The facsimile must contain a photocopy of the Mail-in Card with the full information listed above and must be received by the end of the Sweepstake Period. After faxing a copy of your Mail-in Card, you must still mail in your original Mail-in Card for your facsimile entry to be valid. Your original Mail-in Card must be postmarked prior to the end of the Sweepstake Period and must be received no later than four (4) days following the end of the Sweepstake Period. If your original Mail-in Card is not received by mail within the requested period of time, your facsimile entry will be void and you will forfeit any and all interest in the prize(s). Upon receipt and verification by the Sponsor of your Mail-in Card, you will automatically receive one (1) entry in the Sweepstake. The Mail-in Cards will be considered "Entries" if they comply with the drafting requirements and are received within the requested timeframe. Sponsor is not responsible for any incomplete, late, lost, misappropriated, illegible, damaged, postage-due or misdirected mail-in entries.